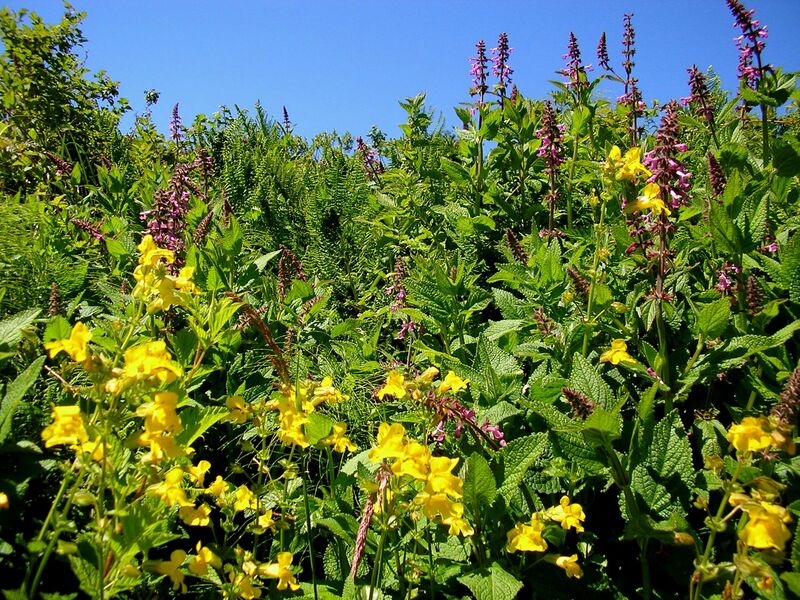 A lush display of Hedge Nettle (Salvia family), Monkey Flower, Salmon Berry and ferns growing in a creek bed. One of the most beautiful hikes in Sonoma County runs from Pomo Canyon Campground to the ocean just south of Goat Rock. About 6 miles, this hike makes a steep climb through a majestic redwood grove before meandering into open meadows and chapparal to the coast. Last weekend we were treated to a phenomenal wildflower show, and some exciting wildlife sightings as well. Among the flowers were the lush creekside plants like salvias and mints, lots of Clarkias, Self Heal and Blue Dicks. Red Elderberry shrubs and striking blue Clintonia berries populated the forest. Among the wildlife we saw was a huge flock of white pelicans circling over the river, a spotted toey, and an osprey. Last year I did this hike at night and observed several large owls hunting in the open meadows. There is a picnic table at the midpoint, on the plateau overlooking the Russian River, a fantastic spot for lunch. Jenny, Eliza, Greg and Sarah work on sheet mulching with cardboard around Juncus Patens (a native rush) and Carex Glauca (a meadow sedge). We built a bio swale in Ragle Park today. This dry creek bed will filter runoff from the nearby gazebo, recharging the aquifer, and providing habitat for native plants and animals. The project was a collaboration between the Sonoma County Parks Department (spearheaded by Jenny and Eliza) and Three Leaf Farms (my sisters and I). We carved out a channel for the runoff, then planted native rushes and sedges. Next, we sheet mulched with cardboard to suppress weeds and retain moisture, and placed boulders to capture silt and debris. Lastly, we added a thick layer of wood chips. 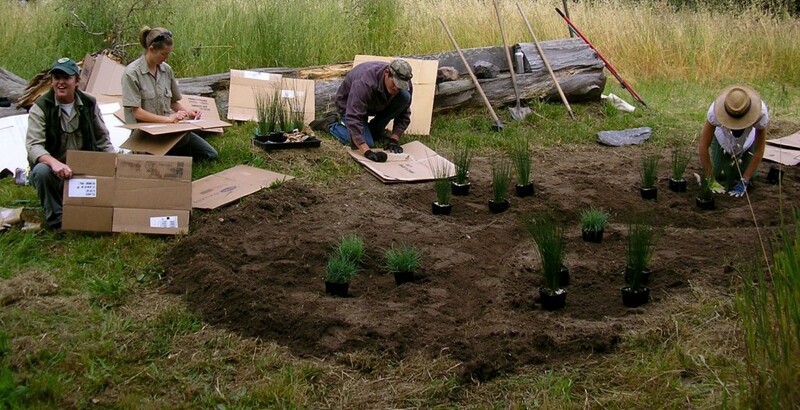 In the Fall, we will seed native wild rye grasses. 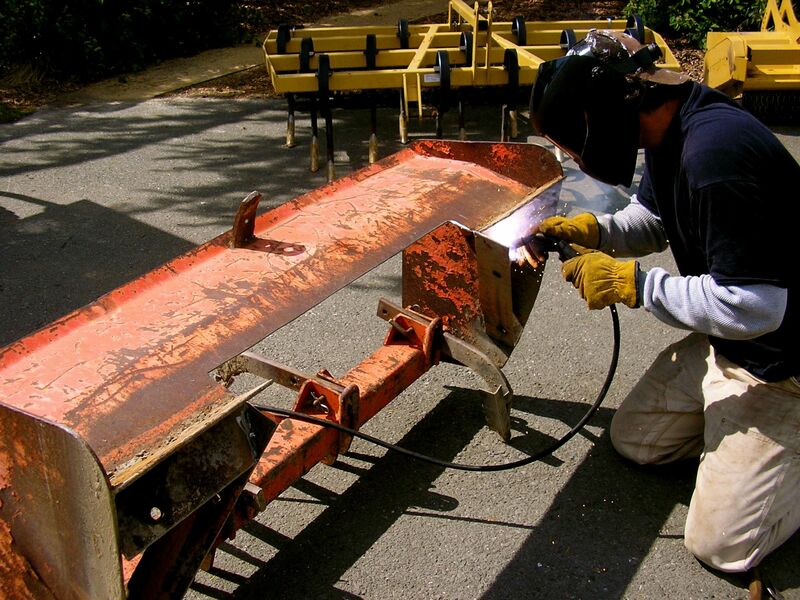 Robert welding soil diverters to the box scraper. Over the past week Robert Kelly and I have been converting (hacking) an old box scraper into a raised bed former. We’ve been making modifications, and then doing field testing to see how our design ideas work and might be improved. The idea is to build a tool that will be specifically suited for our soil and farming techniques. Robert first removed the scraper’s blades and then cut a bed outline out of the remaining steel. Next, steel diverters were added to the side walls to direct soil towards the center of the bed. Robert welded pieces of steel to the scraper’s rippers, which now act like little plows, hilling soil inwards. 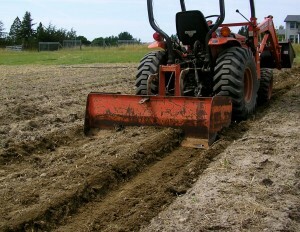 This implement will save many hours of labor that we used to spend raking soil into beds. Soon we will add another tool bar to the back of the scraper to which we can add implements like tines to dig furrows, or wire weeders (spring-steel wires that weed around vegetable rows). The bed former in action. It takes a couple of passes to get a nice smooth bed, this is the second pass. 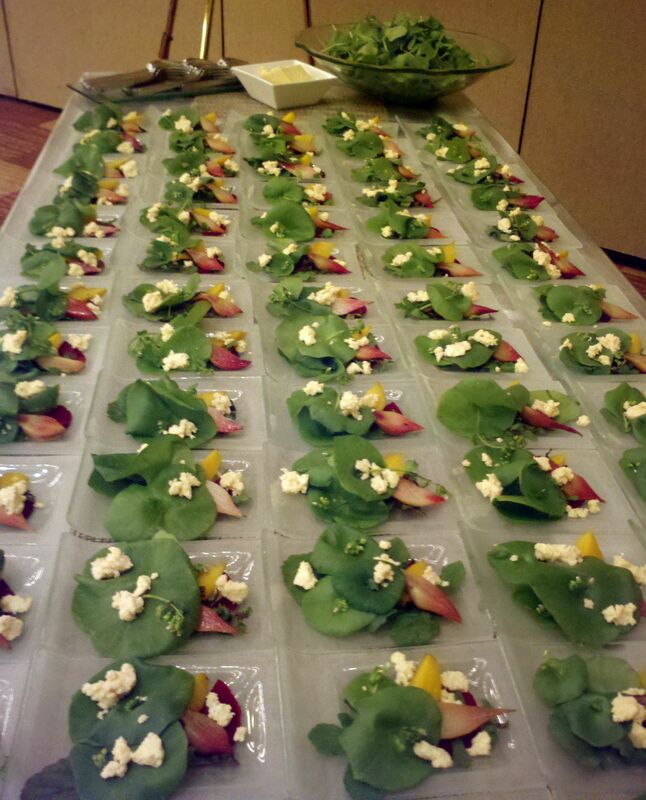 Les Goodman (sous chef at John Ash) and I presented a miner’s lettuce, arugula, pickled beet and raw milk ricotta salad at USF’s Farmer-Chef luncheon. My sister Sarah and I picked 8.6lbs of miner’s lettuce the day before, mostly at Luther Burbank’s original experimental farm, along with a pound of arugula I grew at zazu farm. We talked farming and food with incredible chefs and farmers like Mark Dommen of One Market and Andy Griffin from Mariquita Farm. Les took the leftover salad back to John Ash and added it to the menu, where it promptly sold out. It’s easy to make fun of a plant that is so ubiquitous that many consider it a weed, but you can’t find it in stores, it is chocked full of omega 3’s, and it’s delicious. We served 240 attendees of the USF hospitality management symposium. Lots of people had never heard of miners lettuce, or Claytonia, as it is know on the East Coast where it is grown as a greenhouse crop. It is one of the hardiest winter greens and it is also chocked full of Omega-3 fatty acids. 300 chickens leap out of the Eggstream onto fresh pasture. They are eager to eat the grass and dig for worms. Marc Felton and I helped move Silva Star Farm’s Eggstream trailer from Rose and Thorn to the apple orchard at Rancho Pillow. 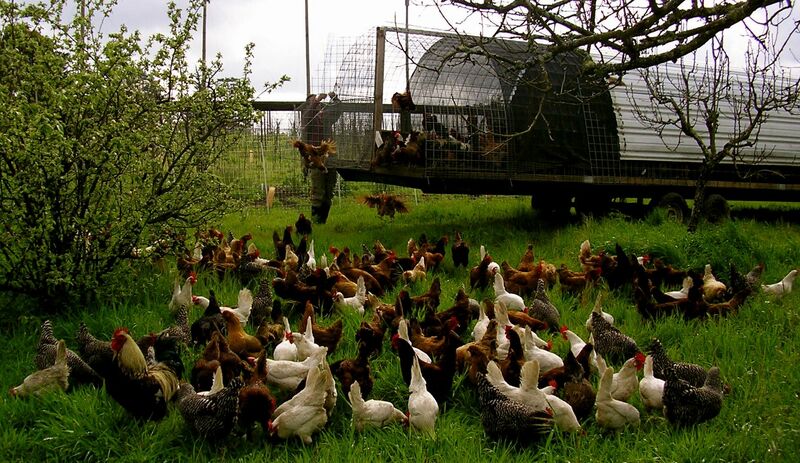 We will leave the chickens in the orchard for about two weeks, and then move them into another pasture. Sarah Silva will be tending this flock and selling the eggs to Bill’s Farm Basket, Andy’s and her chicken CSA. Learn more at Silva Star Farms. Sarah using the tractor to move the Eggstream from the apple orchard to the forest at Rancho Pillow. 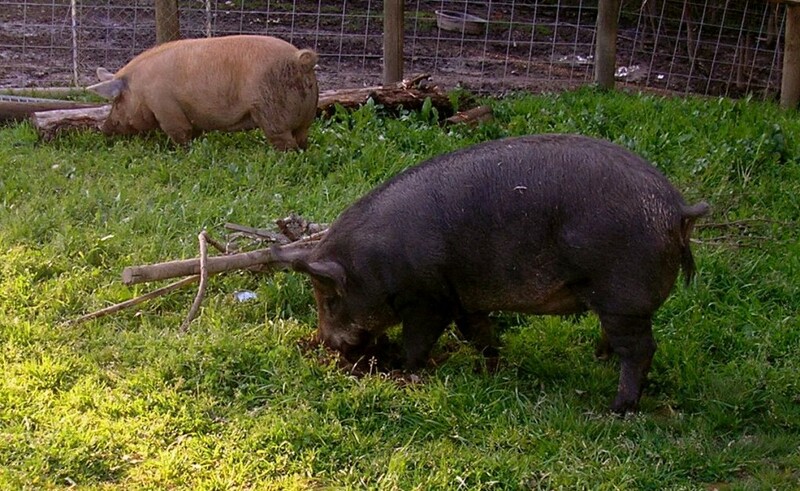 Heirloom hogs eagerly root up the soil at John and Duskie's farm in Forestville. I was about to mow a fallow pasture at Macbryde Farm, when I noticed that the soil had been compacted by years of livestock grazing. John and I decided to let the hogs in to root it up instead of mowing. They immediately started turning over the sod, looking for worms and other food sources. This turning of the soil will reduce runoff and allow us to grade and re-seed the pasture. Each day, these hogs eat expired produce from Bovolo like fennel and melons, and should be succulent when they are harvested in about a month. Duskie and John won first place last weekend at Cochon555 Napa. “Cochon 555 is a one-of-a-kind traveling culinary competition and tasting event–five chefs, five pigs, five wine makers–to promote sustainable farming of heritage breed pigs.” They prepared an entire hog with dishes like Pigs Head Cowboy Beans, Pig Heart Pork Bun, and Bacon Waffles. Mustard sprouts pop up in front of zazu. I planted a cover crop of mustard and fava beans at zazu. 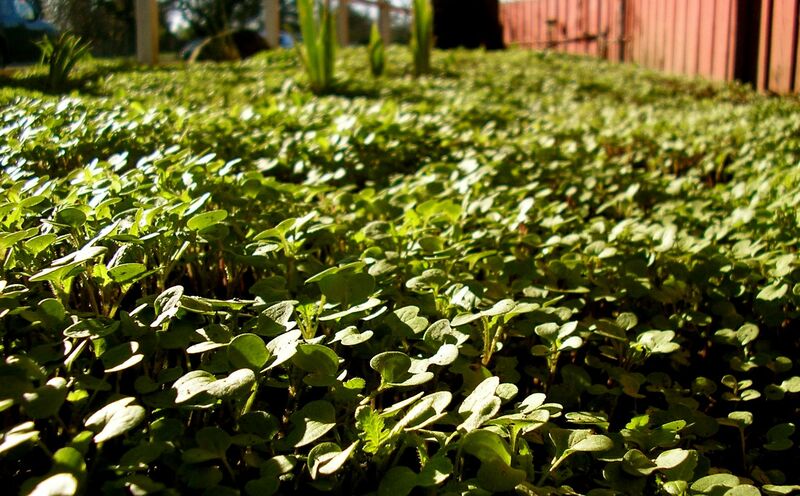 These fast growing plants provide beauty, food and fertility. They also crowd out weeds and help to control pests like nematodes. Right now, the zazu kitchen staff is harvesting these spicy mustard sprouts and adding them to salads and other dishes. In March the Fava Beans will start getting ripe, and the mustard will explode with bright yellow blooms. Mustard is cheap and easy to grow throughout the rainy season. The Bale Grist Mill's water wheel in action on a rainy winter day. My family and I visited the Bale Grist Mill near Calistoga today. After doing extensive research on an organic grain production project in Oregon, I was fascinated to learn about Northern Califoria’s history of grain growing and milling. 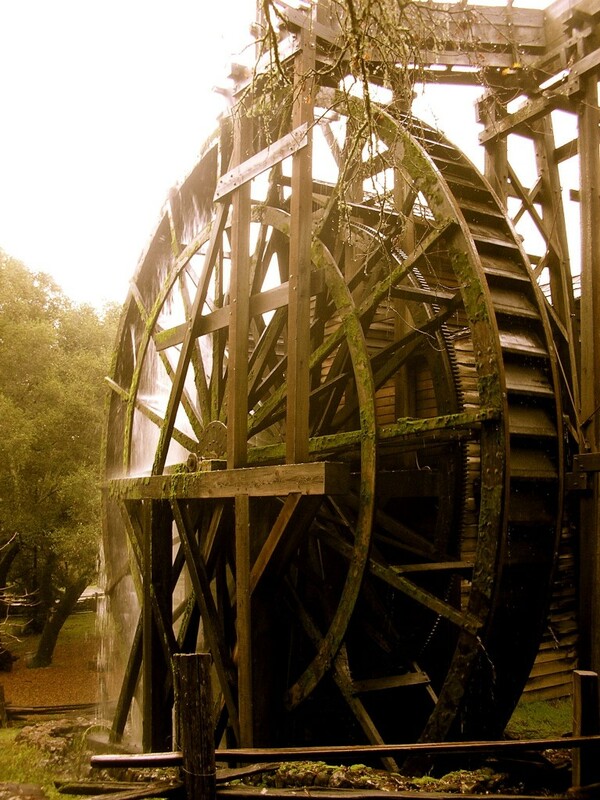 In the mid 1800’s the Napa Valley was a prosperous grain growing region, and the Bale Grist Mill was its hub. Much of the grain grown in Sonoma County was millled at the Bale Mill, due to its efficiency. Founded in the 1840’s by an unsavory doctor from England, who married General Vallejo’s niece, the Mill only became profitable after Dr. Bale died and his wife took over. She hired millwrights that rebuilt the mill in the 1850’s with the help of The Young Mill-wright and Millers’ Guide written by inventor Oliver Evans in 1795. This book detailed Evans’ invention of a fully automated, water powered grist mill, an innovation that laid the ground work for the industrial revolution. Zazu Farm has teamed up with Felton Acres and will now be managing their 3 market gardens. The produce will supply zazu, the zazu farmstand, the Felton family, and their employees. Marc Felton has decided to focus on raising chickens, turkeys, goats and hogs. Inspired by the Joel Salatin and the Omnivore’s Dilemma, Marc left a career at Google to start a diversified farm. 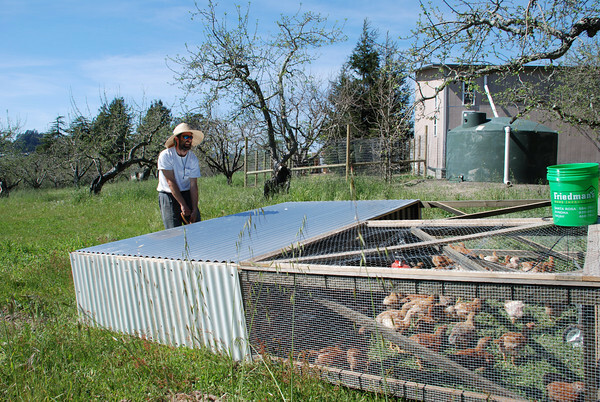 Marc Felton moving one of the chicken tractors that he designs and builds. His farm is on an old Gravenstein apple orchard. I spent two weeks in December studying food aggregation efforts in Oregon. I met with farmers, toured distribution warehouses, and interviewed chefs and other food buyers. The most interesting and effective example of aggregation I found is the Southern Willamette Valley Bean and Grain Project. This project was spearheaded by the Ten Rivers Food Web. Two local farmers teamed up with the project and raised the money to build mills on their properties. The Bean and Grain Project hosted an event called “Fill Your Pantry”, where consumers could buy beans and grains direct from the farmers. The event was a huge success, but some of the larger farms had trouble handling a large volume of retail sales. This sort of one time market could be sponsored by an organization like Sonoma County Farmtrails, and feature products that can last in a pantry like pickles, beans, and winter squash. Hummingbird wholesale is a medium sized distribution company in Eugene. Co-founder Julie Tilt has worked with the Bean and Grain Project since the beginning. With and average of 20% growth a year they have out grown 2 locations in 7 years and are about to move into a third. They use bicycles to deliver much of their produce. 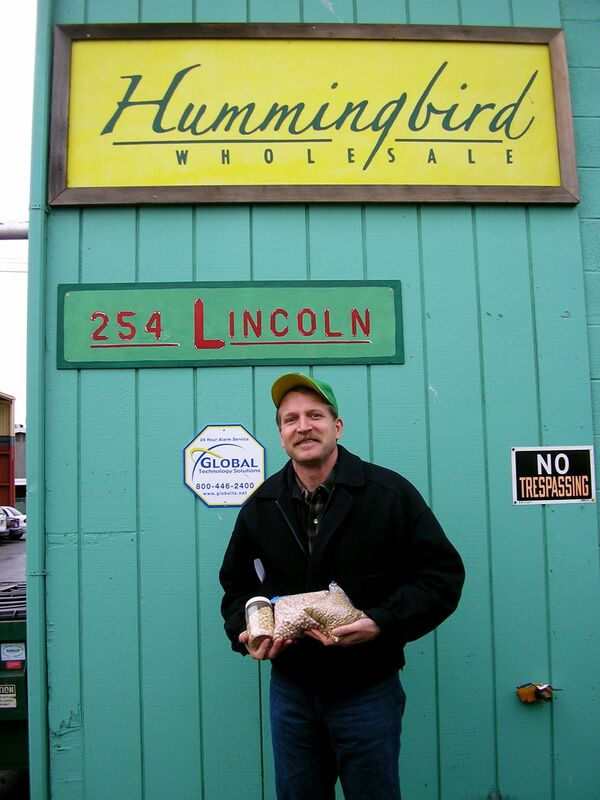 James Henderson in front of Hummingbird Wholesale with some locally grown beans and grains. James is an OSU trained farming expert and part of his job at Hummingbird is to find more farmers to grow beans and grains in the Willamette Valley.